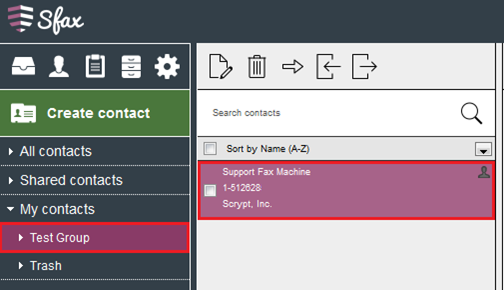 This guide shows you how to create contacts within Sfax. At this point you have the option to Create contact or view All contacts, Shared contacts, or My contacts. Shared contacts are shared between your company, association or group and can be selected, edited, or deleted by any member that they are shared with. My contacts are your own personal contacts which only your user account can see or edit. 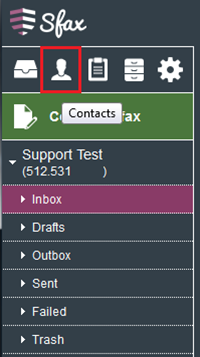 To add a contact click on Create contact. 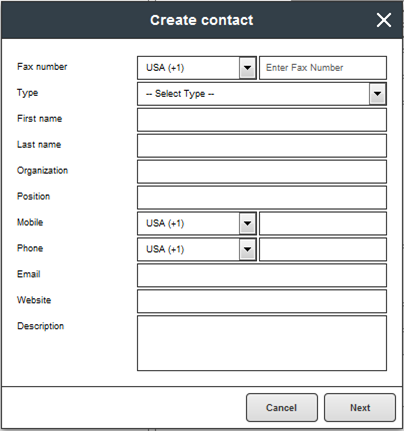 After selecting the Create contact option you will be presented with a box where you will input the information of the contact you would like to add. The Type allows you to select from either a Shared contact or My contact. After you input the information for your contact select Next. 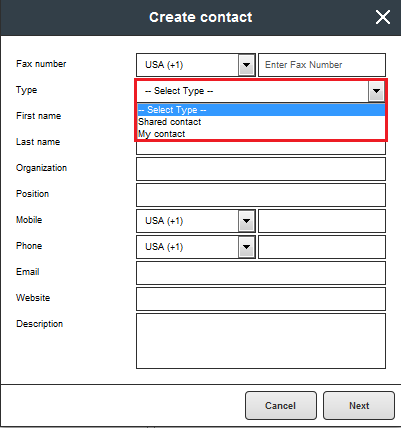 When adding contact information, the contact list will sort by Last name first, and then by First name if there is no information in the Last name field. After selecting Next you are presented with the option to Select Groups. 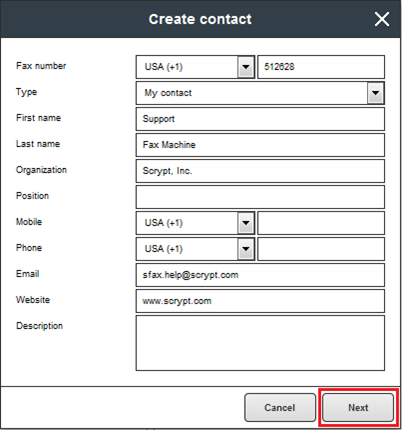 This option will allow you to create groups of contacts under your My contacts or Shared contacts. If you would like to create a group select the Add group icon. If you would like to just add the contact select Save. 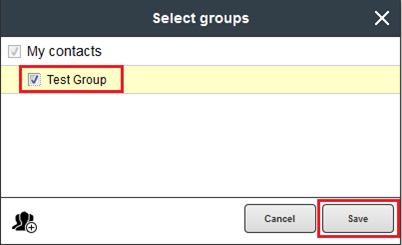 If you select the option to Add group you will be presented with the Add group box that allows you to name the group. Once you have named the group select Add to create the new group. 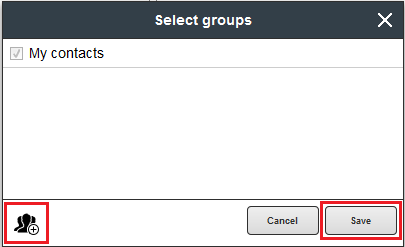 After you have added the group you will be taken to the select group option which will allow you to select where to save the contact. 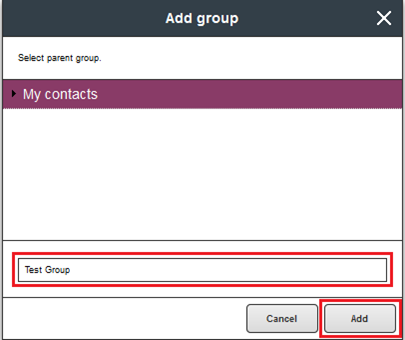 Once you make your selection select Save to save the contact to the desired group. Your contact will now display under the group you created and assigned the contact to. 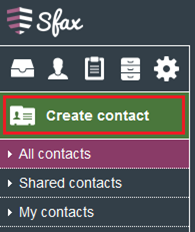 You have now created a contact to use with your Sfax account. The Sort by Name field sorts alphabetically by Last name, and then by First name.